While I now work in a human healthcare system doing work I love, I’ve been lucky to spend a lot of my time working with people and their pets. From co-owning/operating a grooming shop to veterinary assistant to customer service in an online pet company, I’ve worked in many aspects of the pet industry. I’ve also done a little bit of showing in dog obedience, the conformation ring and earthdog as well as training for canine freestyle and tracking. I’ve been out of dog sports for awhile due to lack of time (and money) but I’m planning on getting back in. There is so much you can do with your dogs these days and the dogs love it. I live with what I affectionately call The Zoo Crew. My dogs include 3 Jack Russells (some people consider me insane)- Ricochet, Havoc and Malarky with Mellie, the English Springer Spaniel being the odd dog out. The cats include Omar, Pyro, Bitsa, Charm, Minuit and Poughkeepsie. My ferret busyness (Did you know that’s what a group of ferrets is called?) is down to 2 ferrets, Hijinks and Amblin, from what was once 9. My flock includes Suerto, a Hahns Macaw, Eco, a Senegal, Roca, a Congo African Grey and new arrival Kijivu, a Congo African Grey. And last but not least, is my bunny, Glee (aka Ms Glee the diva bunny) an English Lop. Can you tell I love pets of all kinds? And that’s what I blog about here on afFURmation. I share posts on different topics about different types of pets. Think you know a lot about pets? Starting back up in September will be the monthly contest Pet Pop Quiz where you get a chance each week to test your pet knowledge and get an entry into the contest. Stop back by or follow my blog doings on Facebook or Twitter for notice of the first Pet Pop Quiz in September. Thanks for stopping by to say Hi! Please join me in hopping on to meet my fellow pet bloggers. 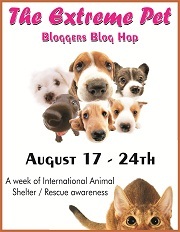 8 comments to Extreme Pet Bloggers Blog Hop- Hello and Welcome to afFURmation! All of your animals are beautiful! I am looking forward to the Pet Pop Quizzes! Love learning more about our blogging buddies!!!!! I’ve just hopped over from the extreme pet blogger blog hop to say hi. I love all your animals. Wow! What a great group of furry and feathery friends! This is my first visit to your blog, and I love it. I can’t wait to hop back over soon. Did I count 17 animals in that description of your household? I have one question for you: how long ago did you stop eating, sleeping and using the bathroom? ‘Cuz I don’t know how else you’d find the time to work, blog, and care for all your animal friends. Pamela- I try not to count them. Somehow having a number attached make it seems like a lot more. We’ve got a routine all worked out an dog help anyone who messes it up!